I saw more snow last week than I’ve seen any week since we lived in Ohio, and maybe more than any week ever in March. It was hard to think of anything else. Something about being stuck at home inspired me to relax more than usual and give myself time off from everything except enjoying the lazy mornings and disrupted schedule. I hope you are, like me, still awed by its beauty no matter how ready we all are for spring. I took these photos on a late afternoon walk after watching the snow fall all day. I only walked around our building, but the same scenes I see every day were transformed into lacy enchantment. Oliver is right about the prettiness, but snow’s reason for being goes far beyond that, of course. Since Eric’s comments a couple of years back about the benefits of snow for the growth of plants, I’ve been experimenting with bringing snow inside to water my indoor plants, some of which I dug up to keep inside for the winter. Maybe it’s my imagination, but I was impressed by how the plants responded. 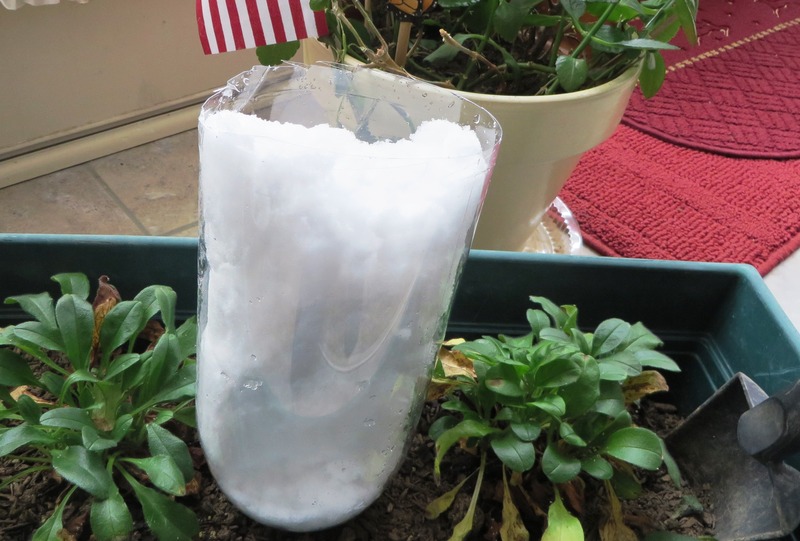 I decided to upcycle my empty club soda bottle to make this handy snow catcher to water my plants. All I had to do was open my door and scoop up some snow — no gloves or shoes or coats needed! — and then it would melt surprisingly slowly, gradually watering the plants. I don’t know whether this will be any better for them than pouring tap water into them, but it was a lot of fun to find a reason to play with snow inside. My houseplants seem to love snow, and this is an easy way to feed them. As pretty and useful as it is, I hope this is the LAST post about snow I will be writing this year! 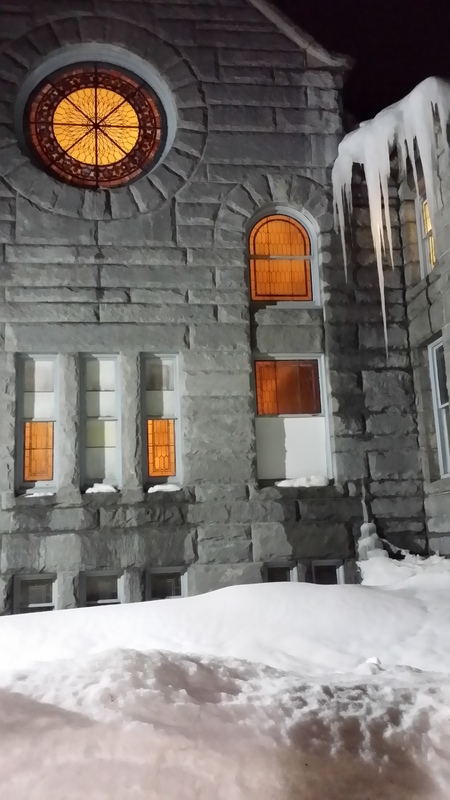 For one last shot of the beautiful snow, here’s a wonderful photo sent to me by a reader, Susan, who photographed her church building one recent evening after choir practice. Light shining in the darkness! Good morning, Julia! What a nifty idea! Maybe the houseplants are inspired by the wildness of water from out-of-doors! Well, who knows what houseplants think; it’s still an interesting idea. Although I’m tired of the snow, I did take more pictures made amazing by snow than I think I ever have before. It was lovely. Enjoy the coming warming trend! Thanks Susan, I did just that today. My walk was so nice and warm (relatively speaking) that I could almost feel spring in the air. Almost. Julia,,, you are kind to give me credit for awakening you to the “treasures of the snows”. I got my initial knowledge from the book of Job, in the Holy Bible. 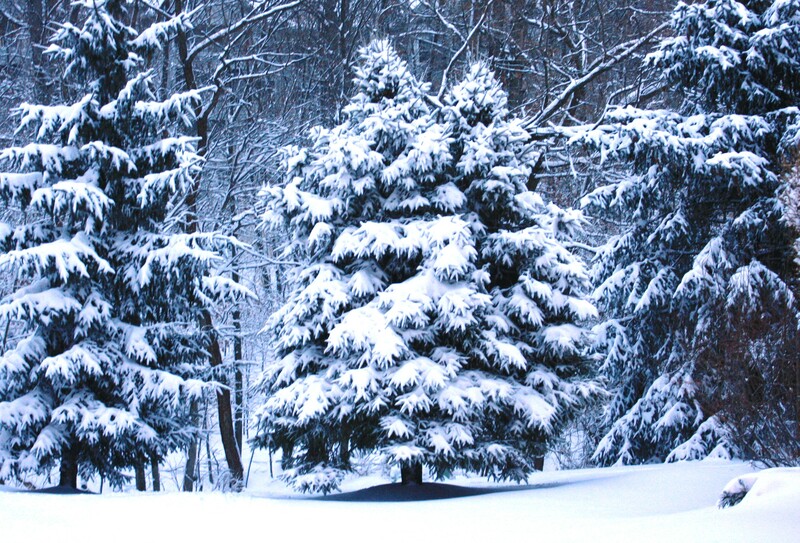 Your embeded link (on the benefits of snow for the growth of plants) is fascinating! I was especially amazed by the production of nutrients by lightning. 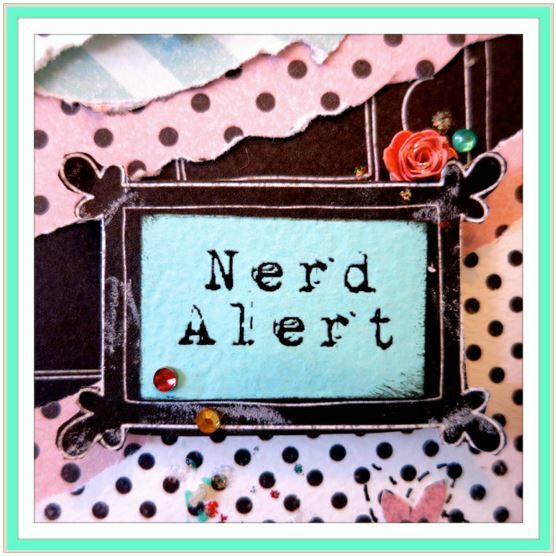 Though not the expressed purpose of your blog, I have always found it to be a springboard for interesting research. Many times it has been in the field of literature, but the occasional foray into the sciences has been more in line with my formal training. One of Atlanta’s “broadcast meterologists” expressed surprise at my knowledge of the weather (we tweet each other often.) I pointed out to her that for 37 years, it was largely a matter of survival – no joke. Isn’t it nice to get to the point in life where we can watch weather from behind glass, maybe even warmed by a wood fire? Spring? Yes !!! Let the fire burn out, venture afield, clad only in jeans and flannel shirt. Hallelujah! Today was a jeans-and-flannel-shirt kind of day around here. Re: weather familiarity: one day last year when I was visiting Mom and Dad, Mom was fretting over the rain that the weatherman on television was predicting. Al and Dad both insisted it was not going to rain, and it didn’t. Mom expressed surprise that they were right and Daddy said “you’d think she’d realize by now that pilots HAVE to be able to read the weather.” 😀 Yes, it is definitely a matter of survival for pilots and whoever flies with them, just as it is for sailors. Whenever I have to take a flight out in rough weather, I pray that the pilots are extra sharp. Sheila, I just hope the plants don’t get “hooked” on the snow and start demanding more of it – I’ll be fresh out by tomorrow! Unless I want to go dig some out of those horribly filthy drifts along the road side, which would probably poison the plants with toxins from the exhaust fumes. Maybe the plants loved snow because I grew them from seeds sent to me from a blog reader in Alaska! But my home-grown begonias loved it too. Hope you are having a good week. How is your hubby doing? Jeff re-started chemo today and he’s feeling OK. Not great but not horrible either. Jeff commented on this month’s Verandah! 😀 It does look lovely. Each day, living in Oregon, I’m reminded of how incredibly blessed I am to live where I do. Even a drive down a local street is a treat with a clear view of snow-capped Mt. Hood seemingly rising just out of reach. Bob, I agree that Oregon would be a wonderful place to live. It has that feel of being an uncrowded and natural environment without feeling remote and isolated. You are definitely fortunate to make your home there. The trees behind your home are so pretty. We got some good pictures of our snow but happy that it is gone, hope that was the last. You all have a great week. Mine should be good, two doctors appointment and still have to take it easy. Spring is on its way!!!!! Hugs and love to all. Hi Carolyn, I hope your appointments go well this week. Our snow is almost melted except for the big drifts. I would be amazed if this was not the last of the snow this year, especially for y’all. I was trying to remember if we ever saw snow during the years we lived in Memphis; if so, I don’t remember it, though I think we did get some ice. I do love those evergreen trees. I’m glad they planted a few back there when they developed this community. Love to you and Terry. I’ve loved all the pictures of snow that have been on your site recently, but guess it’s great to look at and play in for only a short time! We’ve been having a very hot spell here, high 20s and into 30s (c). Autumn is just around the corner with some trees showing a slight change in colour, although we do not have the abundance of beautiful trees you have. Our gum trees and natives stay much the same all year except when the new growth starts adding pink and reds on the tips and of course lots of natives have flowers, some very tiny. So as we’re looking forward to a respite from the heat I can imagine you are waiting expectantly for the wonderful spring season to arrive. Hope all is well with your family. Hi Dorothy, thanks for bringing us a touch of warmth from NSW! I so hope to see it one day for myself. In fact it would be a great winter getaway. The flowers and colors sound beautiful. In California our trees stayed mostly the same year round, and I never tired of them. Occasionally when we would drive inland to mountains of the Gold Country I would really enjoy the fall colors, but I also loved the year-round flowers and greenery. Your mention of gum trees reminded me of the song about Kookaburra which I was singing to our grandson Grady just recently. I used to love singing it when I was little and it’s still lots of fun! Do you sing it in Australia or is that just a USA kid’s song about Australia? Thanks for being here — and Happy Autumn! Julia, hello. Beautiful pictures. Fresh snow is beautiful but a little goes a long way with this transplanted Georgia girl! Merry, as a transplanted Georgia girl, I know exactly what you mean! I’ve been hoping that all this snow will mean the crepe myrtles will be extra dazzling this year. They’re as gorgeous as the cherry blossoms, and last much longer. Hope you are doing well. It’s warming up here, and I’ll bet it is there too. Julia, I posted a comment, it seems to be lost in cyber space. Oh well, beautiful pics. Merry, I think the comment did come through…do you see it? I get annoyed when I try to post comments on WordPress because often they just seem to disappear without telling me my comment was posted or is in moderation. Then I never know if it got through or not. Thanks for being tenacious! I love to hear from you. “lacy enchantment” indeed! What a perfect comment for the snow-ladened trees! Great idea to water the plants w/ snow. I do not use water straight from the tap for plants. I let water sit to rid it of chemicals that are added by cities. I also use leftover water in water bottles. We are upcycling together. The “ice-tags” hanging on the church are magnificent! Praying for Jeff! Mary Ann, I had read that years ago about letting water sit before watering, but had forgotten it. However, I do it naturally, because when I run the water to get it hot for a shower or bath, I catch the cold water in gallon jugs and save it to water plants. (I can just imagine someone rolling their eyes and wondering if I save string! I don’t.) Those icicles on the church ARE stunning, aren’t they? Imagine coming out of choir practice and looking up to see that! Perfect timing, like getting an answer back. Thanks so much for your prayers. Jeff is holding up well so far, though the neuropathy hit hard and fast, as they had warned him it might. Hi Julia, yes, it’s Nashua, New Hampshire. It’s been warmer, and last night during rehearsal we heard a rumbling and then a sliding, thumping sound, as an Avalanche left the rooftop for the parking lot below (the staff had put up cones to prevent parking in that region). So winter is leaving us – but grudgingly – today calls for a rain-snow mix! Hi Susan, it sounds like spring is on the way for you. We have had three lovely days here. I have been enjoying being able to walk outside again without fear of slipping on ice. I have some bulbs I forgot to plant last fall that have started to sprout indoors. I was planning to plant them last month, but the weather got in the way. I hope it’s not too late now. Have a great (and hopefully sunny) weekend! Yesterday we had record rainfall- 1.7. inches in 24 hour period. I did not know about the snow- plant connection. We have used such bottles for outside plants at times of drought- very rare here in Seattle. Michael, I love Bill Murray and really want to see that movie. As a former children’s librarian, I’m embarrassed to admit I’ve never read Tuck Everlasting, but it is definitely considered a classic. On my “hope to read it someday” list, I guess. I am starting to wonder if the snow doesn’t partly explain why the most gorgeous gardens I have ever seen are in Canada and the northeast and northwest corners of the USA. You are lucky that drought is rare in Seattle, though it’s nice to have lots of sunshine too. Friends of ours we knew in CA who now live in Colorado Springs have told us they don’t mind the cold because it’s so sunny there. I have a phone interview today for a position in Austell, GA with Wellstar Hospital. In “Tuck Everlasting” a family finds a magic spring with Fountain of Youth, i.e. immortal qualities. They soon find out that such an existence does have its plus and minuses. There are some cool extras with the film with interviews of Bill. Apparently the film is based on the real life uncle of the director Tim Melfi. Let me know what you think. Good luck on your interview with Wellstar! Hope you all will be able to move nearer to the grandkids and enjoy my beautiful hometown. I’ll try to watch that film soon. I think the last movie we saw may have been that one with Judy Dench you told us about. We don’t watch a lot of movies but since we’re on Downton Abbey break 😀 we might be able to watch a few. We have gotten to the age that we fall asleep if it’s not really good. But I can’t imagine falling asleep while Bill Murray was on. Thanks for the tip. I gave it two thumbs back and it has some good lines Like, “If you are going to gamble you might as well give yourself a chance to win big.” Sage advice to the young Oliver. He supposedly is back into the stream of consciousness thing here. Which is what I am not sure, putting it all out there on the page in a river of thought? I found some Cliff notes for the novel which is helping a fair bit as I have a little trouble keeping all these durn characters in place. It takes a fair amount of concentration- don’t you know. I reckon. It seems like the young girls- Dewey Dell- (where does he come up with such names- Dewey for a girl?) are always getting into some kind of a fix in his stories. Quite the genius. Written in 1930- only 85 years back. Michael, I’ve only ever read one Faulkner book, and it was a minor title I can’t even remember. I realized that’s scandalous for a southern library lady to admit, but there it is. I do have him on my “to get to one of these days” list, but my sister told me enough about As I Lay Dying (which she had to read in high school) that I decided he probably wouldn’t be my cup of tea. I do like Steinbeck very much, but actually haven’t read too many of his either. Of Mice and Men was enough to make Steinbeck a genius in my eyes. I am also reading “Dog of the South,” Charles Portis- much more to my liking. “Mice and men” is also on my list and his little travelogue-“Travels with Charley.” Charley I think was his golden lab. I read in high school. I probably should have talked to your sister, but it was my daughter in law who asked me to “explain” -Sound and Fury” to her. Can’t believe y’all still have a bit of snow. Six inches new in NYC. And now for my rant. There is a lady in our church- battling cancer- stage four- now ten years. She recently told me her entire S.S. check goes for medication, one of which costs $700/ a month. I am sure this is not an isolated case. There should be a law. What if all the boomers got together and fired the insurance providers? Michael, I want to read Travels with Charley too, and also The Winter of Our Discontent, neither of which I’ve ever read. At the Steinbeck museum in Salinas, CA (a great place for any Steinbeck fan to visit) they had the actual car in which he traveled with his dog while writing the book. You REALLY don’t want to get me started on the failures of health care reform where the pharmaceutical industry is concerned. One reason I became actively involved in the move to reform health care, was my concern about the runaway costs and use of overpriced pharmaceuticals. Read this column by Bob Herbert of the NYTimes, written back in August 2009. This is when the White House lost me as a supporter of their proposed health care reform plan, and much of what Herbert predicted is coming true. Big Pharma and the other players with power and money are better off than ever before, and every day I hear another horror story about health care costs hitting individuals and families. So much for reform. OK, I’m ranting now. I am very thankful Jeff had the right stuff to do well in the Air Force for 30 years, since he has pretty much the best health care available at no out-of-pocket costs. Considering how much Matt has had done over the years (5 open heart surgeries and countless other hospitalization) we’ve spent very little on his medical care because we’ve had great insurance. I have never been unaware what a rare blessing that is, and it’s why I STILL hope to see meaningful health care reform taking place. Firing insurance providers isn’t an option for us, because only the extremely wealthy (billionaires) could afford care for a catastrophic illness. Having said all that, I realize it’s a very difficult issue to solve, for anyone. People live longer, more treatments are available, and consumption has risen dramatically over when health insurance first began. No easy answers. How do we fight back- Big Pharma? As I sign up for Medicare, I feel I am being punished for relative health as we don”t really have any prescriptions but have to sign for a drug plan anyway. I should say I did not have any insurance for three years- being between jobs. I paid out of pocket and went to a “doc in a box” facility here. I have to read the article again. I especially enjoyed the adjacent article on creativity in our later years- crystallized versus fluid intelligence and how crystallized intelligence can be developed over a lifetime. Some of the people mentioned were Grandma Moses, and a writer of children’s books whose name escapes me Lesley Shackleford? She is writing into her 80’s. Also some folks are picking up an instrument and learning to play in their 60’s, which is kind of cool. As for fighting Big Pharma, I reluctantly concede I don’t know how to do that. Pandora’s box has been opened and we are a drug-taking culture, just as Brave New World predicted. That’s not to say that all drugs are bad, but in my opinion they tend to be over-prescribed to help us avoid making other, harder changes. If I had my way, I’d start by banning direct-to-consumer advertising of prescription drugs (something we did not allow until the 1990’s, and in which we are still one of only two countries that do, unless things have changed recently). Big Pharma spends more on advertising than they do on research & development, focusing more on creating needs for their new products than filling already-existing and pressing needs. I realize I might get a lot of arguments about that, but I’ve been watching the medical world close-up since 1981 and that’s my inescapable conclusion. Drugs can be a great blessing, but I never want to fall into the trap of thinking prescription drugs are the whole answer to anything. Years ago when I was diagnosed with (relatively mild) ventricular tachycardia and prescribed cardiac medication, I asked the cardiologist whether it was not possibly a result of extreme stress (I was under a lot of Matt-related stress at the time) and he said yes, of course it probably was. I asked whether he was willing to let me try making some life changes in lieu of going on medication, and see how that worked out. He was very supportive and told me most patients told him “I can’t decrease my stress; I need medication” — he said he wished more people were willing to make changes rather than go on medication. It was around that time I started walking daily, beginning with two miles per day and increasing to five, and becoming very diligent about maintaining healthy sleep patterns for myself, along with eliminating whatever sources of stress I could possibly get rid of. This meant giving up on some things and accepting some situations I was unable to change. Long story short, nearly ten years later I am doing fine without cardiac meds. I still have a prescription to take as needed if my heart starts acting up, but so far I have not needed to take it at all. I know that’s a long answer to the question of how to fight Big Pharma, but I guess the short answer is that most of us really don’t want to fight them; if we do, we can seek other options, take generic instead of brand name drugs (a lot of the marketing around new “improved” versions of older drugs is just HYPE) and bear in mind that drugs are almost never a magic bullet to cure whatever is ailing us. Diet, exercise and lifestyle changes go a long ways toward healing almost any malady I can think of. Her name is Lucille Shulkapper and she writes Chap books? Have you heard of these? As far as I know, a chap book is a self-published (and often self-produced) book of poetry; they were often the only way poets can publish their work, at least in the beginning, though digital publishing has changed that. I don’t hear of them in any other context in contemporary society, thought this site from MIT gives more historic detail. They keep trying to get me on BP medicines, but have been trying other things- such as walking. In Brave New World- the state gives you a daily dose in the A.M. and the P.M. -right? I think that was also the theme in ” Divergent”- where everyone gets the same drug to keep them all on an even emotional keel- all the time. There have been a number of these Dystopian films out recently. Some of these trends may also be cultural as I understand in Germany that many persons are put on blood pressure medications for low blood pressure. Imagine that. And we once irradiated the thymus gland in babies thinking it was an enlarged thymus gland that caused SIDS. Many of these people developed cancer in adulthood. Some of our current medical practices may be deemed bizarre by history’s watch. Michael, I so agree! One of my favorite movie lines of all time was in the Star Trek movie where Mr. Spock (I think) was stuck in the 20th Century with some kind of illness or injury, and one of the crew said, “Captain, we can’t leave him in the hands of 20th century medicine!! !” Watching the brutal cancer treatments that seem to have greatly prolonged Jeff’s life (even one year seems “great” when faced with the idea of losing him) I still feel strongly that someday, if the world survives and medicine progresses, we will look back on chemotherapy, radiation and even surgery with shudders, much as we now look on the “therapeutic” use of leeches, only much worse. Sometimes on Jeff’s harder days when he is tired, and I ask him how he is doing, he answers “I’m being poisoned.” That’s about as close to negative talk as he gets, but the truth of it always hurts to contemplate. I really like the dystopic novels, and some of the best are written for young people. The Giver (by Lois Lowry) and Feed (by M. T. Anderson) and The Last Book in the Universe (by Rodman Philbrick) are some I would recommend to adults as well as young people. If we migrate toward the Young Adult novels does that a diminishment of capacity? No- of course not. Michael, Rick does have a book out and I have a copy which I’m already enjoying. I’m learning some interesting things about my relatives (!) – I will try to email you some photos and tell you a bit more. He is my mother’s cousin (actually second cousin I think) and though I grew up hearing about him, I have STILL never met him face to face – however, he was gracious enough to put a sweet personalized note in my copy of the book. I think that writing for children and young adults is actually more difficult than writing for the adult market. The fact that so many celebrities publish less-than-stellar books for children simply because their name sells books, does not change the mastery shown by the really good authors and illustrators of children’s and YA books. I think adults who never enjoy children’s or YA literature are missing out. I don’t recall that Spock quote, but I will remember it. 20th century medicine. Of course, you know leaches are being used today in certain instances of vascular disease. I had heard of that, but don’t know much about it, except that they are (hopefully) past the idea that bloodletting is an effective treatment for disease. 40 years ago when I toyed with the idea of majoring in biology (which I could never have successfully done, I feel certain) I used to say that the cure for everything would come down to genetics and/or immunology. That seems even more true to me today than it did then. Great! I hope you like it. Let me know what you think. I found the chapter “The trouble with Looping” especially horrifying.